Remote and pump mounted manifold blocks for your SPX hydraulic cylinders and tools. Full the full range of Power Team manifold block available from UK platinum SPX distributor, SGS Engineering. If in doubt, ask out in house team of 700 bar hydraulics experts. At SGS we have a substantial range of hydraulic manifolds for you to choose from. With both remote manifold blocks and hydraulic manifold blocks to choose from, you’re sure to find exactly what you’re looking for. Browse our listings and place your orders today. Our selection includes hex shaped manifold blocks, multiple cylinder hydraulic manifold blocks and manifold blocks with needle valves. Our manifold blocks are available in different lengths and are extremely useful when it comes to connecting two hydraulic cylinders to a single line. As such we’re confident there will be a hydraulic manifold block to suit your needs. No. 9691 - "Y" Manifold - Extremely useful when connecting two hydraulic cylinders to a single line. Has three 3/8" NPTF ports. No. 9634 - Manifold block - This manifold is for multiple-cylinder installations, has four 3/8" NPTF ports and two 1/4" mounting holes. No. 9635 - Manifold block - This hex-shaped manifold offers extra versatility with six 3/8" NPTF ports and two 1/4" mounting holes. No. 9617 - Manifold block - When a multiple-cylinder installation is required, this manifold is invaluable. Has six 3/8" NPTF ports to handle larger multiple-cylinder systems. No. 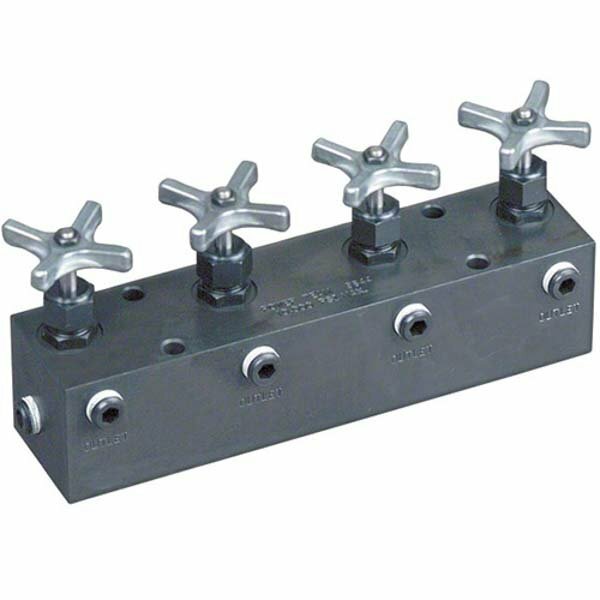 9648 - Manifold block - This 7" long manifold block has seven 3/8" NPTF ports and two 1/4" mounting holes. No. 9627 - Manifold block - This 16" long manifold block allows you to mount the 9575 or 9596 valves without interference. Has seven 3/8" NPTF ports and two 1/4" mounting holes. No. 9626 - Pump mounted manifold block - Converts pumps with pump mounted valves for use with remote mounted valves. This manifold block is subplate mounted on the pump cover plate and provides 3/8" NPTF pressure and return ports. Maximum recommended flow rate is 19 l/min. Note: If used on PE30 or PG30 series pump, 12.7 mm longer mounting screws are required. Order four (4) No. 11956 screws separately. For independent multiple-cylinder operation, feature needle valves for precise manual control. Designed for remote-mounted applications. Can be used with all Power Team pumps. No. 9642 - Manifold with two needle valves for control of two cylinders. Has four 3/8" NPTF ports. No. 9644 - Manifold with four needle valves for control of four cylinders. Has six 3/8" NPTF ports. Check out our comprehensive selection of remote and pump mounted manifold blocks for your SPX hydraulic cylinders and tools. View the full range of Power Team manifold block available from UK platinum SPX distributor, SGS Engineering. If in doubt, ask our in house team of 700 bar hydraulics experts. For more information call SGS on 01332 576 850 and we’ll be happy to advise you on which hydraulic manifolds are the right choice for your needs.